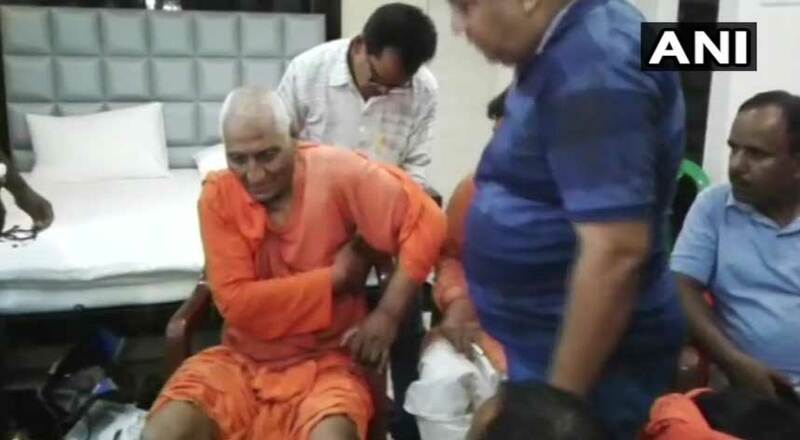 Eminent social activist Swami Agnivesh was assaulted by BJP’s youth wing workers in Jharkhand’s Pakur area today. The video of the assault that took place in broad daylight has gone viral. Agnivesh was there to attend an event in a hotel. The moment he came out of the hotel, he was attacked. The assaulters were reportedly upset with Agnivesh’s recent statement defending consumption of beef. They thrashed him and tore apart his clothes. He was also shown black flags. Swami Agnivesh is one of the most prominent social activists in India who always stood up for communal harmony. “As soon as I came out of the venue, BJYM and ABVP activists attacked me without any provocation. They alleged that I was speaking against Hindus,” Agnivesh told PTI. “I thought Jharkhand was a peaceful state, but my views have changed after this incident,” he said. “There was no police personnel present there. Even when I repeatedly called SP and DM they didn’t turn up. I was told that ABVP & BJP Yuva Morcha workers want to protest. I told them there’s no need to protest, they can come in and talk. No one came in at that time,” ANI quoted Agnivesh as saying after the attack. “When I left from there, they suddenly attacked and hurled abuses at me. I want that they be identified from CCTV footage and video available with media and action be taken against them, he added. The BJP, however, distanced itself from the incident saying its workers were not involved in it. “They weren’t workers of our party. We condemn this but his track record is such that this reaction doesn’t come as surprise. Pakur has recently been in news for religious conversion,” said P Shahdeo, Jharkhand BJP spokesperson. This is not a new thing for BJP and RSS activist to attack those who do not agree with their ideology. Agnivesh was attacked by the hoodlums of the same party in Chhattisgarh , Bastar also. Aattacks have increased in last 4 years since new rulers have captured the resime in Delhi. Lives of intellectuals, journalists, minor community, dalits is in denger since then, people who have voted for such a party will have to think to remove it from ruling. Swamiji is a great votary of human rights. Any attack on him is attack on decency and is done by those who do not have courage of their own convictions. They are fit for boycotting them until they reform.